For me, the hardest part about packing is getting all the laundry done beforehand. The actual parking part? That’s easy. 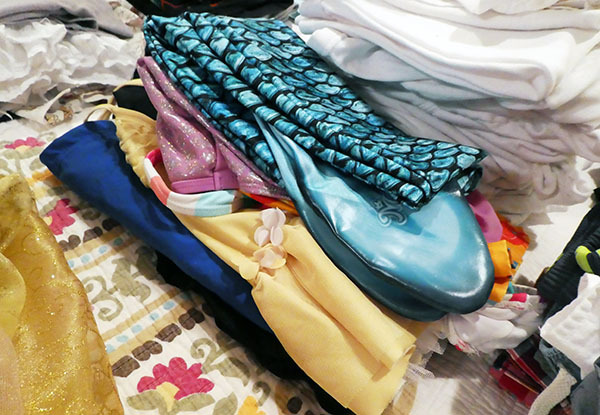 When we started traveling for weeks at a time, early on I knew I had to figure out a way to streamline the packing process. I am close to owning 10 hair brushes now because a hairbrush was the one sure thing I would always forget. Finally, tired of the hassle I sat down one day to make a Master List. This Master List is stored in my google drives, and I can access it on my phone. I simply turn on some tunes, pull up my list, and get to work gathering the needed items. You’ll only have to make a Master List once, and we’ve done most of the hard work for you. This list will change as your family changes, as your children grow, and depending on the season you are traveling in, or into. This list covers all that. Items on the list are grouped into same type items so you can grab similar items for each trip. I use our King Size bed as a landing port for all the items. Once I can visually see everything and check it off the list, it simply goes in the suitcase ready to go! Freebie – See below how to get yours! This is the part of your packing that will take up the most time to gather and assemble. As I said, laundry is the thing that takes the longest when it comes to packing. If all your laundry is done before your trip, you’ve not only given your future self a gift, but you can easily grab the clothes you want without any guesswork. This is obvious, but the clothes you need, depends entirely on where you are going. You’ll want to check in advance for the weather, and which activities you’ll be doing. Then you’ll want to figure out how long you’ll be gone for. How dirty do my children’s clothes get? How important is it that we have something different for every day, or every activity? What activities are we doing? Hiking? Skiing? Geocaching? River Rafting? Theme Park? Can I wear a pair of shorts or pants two days before washing? Am I traveling with a baby that can’t keep her clothes clean? Then pack according to both the needs of your family and for the activities you’ll be doing. 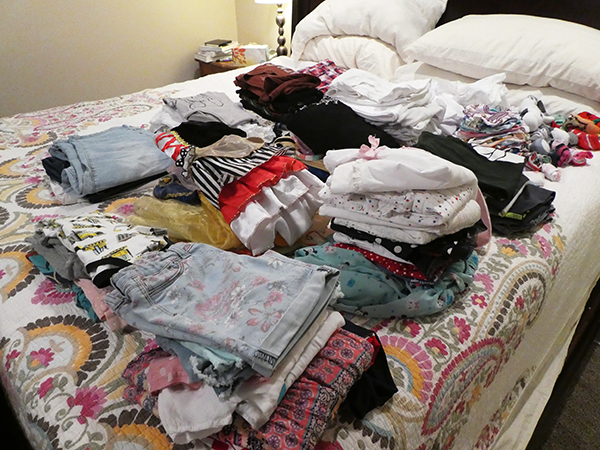 As a rule of thumb we pack for one week, while our baby gets an extra three outfits. For example, I will take three dresses, two pairs of shorts/jeans, and three t-shirts. We will wear our shorts or jeans two days before washing, and have a new shirt for each day. If we are gone longer than a week, we plan on doing laundry. Most hotels, every airbnb, and all resorts have a wash room. You can do multiple loads in one shot, and be done in an hour. That’s a lot easier than carrying around extra baggage. Will you be traveling over a Sunday, and will you be attending services? When at home, we wear our Sunday best. When we are traveling we wear the best we have for Sunday. For my husband, this means a nice pair of slacks, or a colored pair of jeans, and a button up collared shirt. For me, it means a dress. Same for the littles. Tennis shoes, or sandals work great. It may just be my opinion, but God only cares that you are making church a priority on vacation not that you are wearing a ball gown. We take two pairs of shoes per person. Typically we take sandals if we are going to a sunny location. Sandals go with everything, and while it may not always be fashion forward, for us, traveling is about the adventure not showing off our footwear. The sandals are wrapped in a garbage bag with heels touching. Our second pair of shoes are always tennis shoes that we wear on the airplane. If we aren’t going someplace warm, we simply forgo the extra pair of sandals. We take one pair of pajamas per trip. These clothes won’t be worn outside, they aren’t going to get particularly dirty, and no one else is going to see them. If our baby is attached to something to sleep at night we bring her special blanket. If it helps your child sleep on the airplane, or in the hotel, or comforts them – don’t leave it at home! I also prefer to have our babies sleeping on our crib sheets from home, so we pack one of these as well. The smell of home is comforting to them, and you can sleep at ease knowing they are sleeping on clean sheets you washed with detergent that doesn’t irritate their fresh skin. If your children aren’t potty trained for bed, bring nighttime diapers. Yes, some places you’ll be able to buy them, but there are some things you don’t want to have to worry about. Not to mention, it’s not always that easy to find what you are looking for. One trip in particular we forgot them, and we had to makeshift a cotton diaper from the hotel towels. No one appreciated this. This one is easy – one pair of underwear per person, per day. Pack extra if any one of your children is going through a regressive phase. Yes, we pack diapers. Most people will tell you not to, but we disagree. Diapers are as important, arguably more so, than any other item you need when away from home. You don’t want to arrive, and immediately scope out a place to buy diapers. What if you are in a place where you can’t find diapers, or can’t find diapers in your baby’s size? If you do buy diapers away from home, you’re going to pay double the cost, or more. What if you aren’t renting a car? What if public transportation doesn’t take you to a local grocery easily? Do you want to load up the whole family to go for a diaper run, or is one parent going to leave while the rest of you wait? We aim for 5 diapers a day per child, which will even itself out. The best reason to take diapers? You have tons of extra space for goodies or souvenirs on the way home. Same as with shoes, we take one swimsuit per person. We also take swim diapers, because like nighttime diapers, you may not be able to find them – especially in the size small. Take it from our experience. You always need a swimsuit. Even if you are going to sleep in an igloo in the dead of winter in Finland – chances are there will be at least a hot tub nearby. Find out if the place you are staying will have a pack and play. If you are staying in a hotel, you can pretty much guarantee they’ll have one, but we found out early on with our twins they typically won’t offer you two. We had to start packing one with us wherever we went, and then we’d plan on using the hotel’s for the second one we needed. You can’t rely on an airbnb to have one. Pack the baby carrier, and you’ll probably be pushing the stroller in the airport, but put it in the car when you reach this item on your checklist or you just might forget it! We have 3 extra umbrella strollers, in addition to our 10 hair brushes, for this very reason. I’m very particular about laundry, so I only like to use specific brands of laundry soap. We buy capsules to take with us, and then we bring enough for however many loads we plan to do while we are gone. This is pretty simple to determine. If you pack for 7 days, and you’re gone 10, you’ll take 3 capsules. One for whites, one for darks, and one for colors. You can adjust this accordingly. Again, the convenience of not having to search for laundry detergent, particularly in many countries where they do not have the brand you prefer, or finding something free of allergens may not be simple. We also grab several small garbage liners for our dirty clothes. They are bigger and last longer than a used target bag. They also keep dirty, smelly clothes separate from clean clothes inbetween washing. I work for an airline, and I’m shocked how often I hear people tell me they pack their medicine in their checked bag! No, no, no, no, no!!! This is the number one rule of packing, keep medicine on your person. It’s best to pack the medicine in the original container with the prescription on it, but it’s not a hard and fast rule. Go through a daily checklist of what medicine you take, and customize this section for that. For example: I am diabetic with an insulin pump. I need a battery for the insulin pump if it gets low. I need alcohol swabs each time I change my site, and I need a reservoir and an infusion set. Typically, I only change my site once every three days, but when I’m on vacation I want to be prepared in case the site gets ripped off, comes loose in the water swimming, or doesn’t take when I insert it. I take one per day and I bring enough insulin to cover the length of the trip, plus one extra bottle should it get dropped or broken. Make a list of everything you need, and list each item individually (Test Strips, Insulin, Pump, Battery, Sensor, Reservoirs, Infusion Sites). 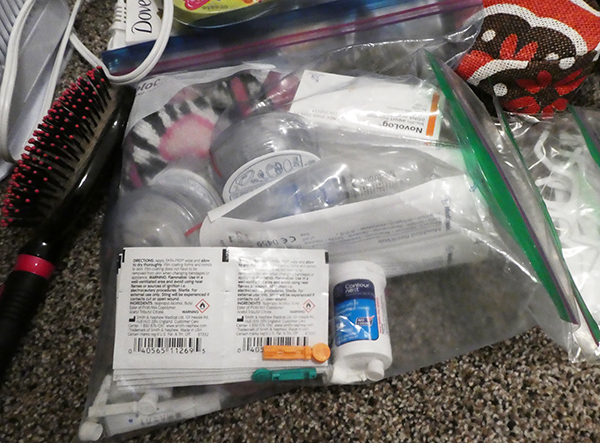 If you keep this section labeled medicine, you’ll find yourself 5 minutes away from the airport and have to cancel your trip because you forgot the actual insulin – can you guess who that happened to? When it comes to vitamins pack everything you can’t do without. Prenatal vitamins, magnesium, calcium, and anything you take on a daily basis. Count the number you need, put them in a baggie, write the name of the vitamin on the baggie with a sharpie. What about Garlic Oil? This is our number one can’t live without item when we go on vacation. We use it to dry out little ears after swimming and it’s a life saver! I always swipe the extra bottles of shampoo and conditioner at hotels. Maybe I’m a clepto, or maybe I think I paid for them. Either way, they come in handy. You might be staying at an airbnb that doesn’t have these items, or maybe – as in our case with 3 girls, need extra conditioner; especially if you are going to a beach. I have four small boxes in my garage. One is full of shampoo, one conditioner, one lotion and one is full of extras such as travel size bottles we grab when we find ourselves at Walgreens of sunscreen, gel, toothbrushes, toothpaste, cotton swabs, floss, deodorant. That way we aren’t competing with what we use everyday, and it’s already ready to go in a carry on. When it comes time to pack, it’s all there for me. I just have to grab however many of each I need for our family. Invest in clear, zippered bags. Have at least 5 on hand, and stuff them full of all your toiletries. Family Hint: When it comes time to go through TSA, you don’t have to pull them out of your bag because they are already in clear containers. 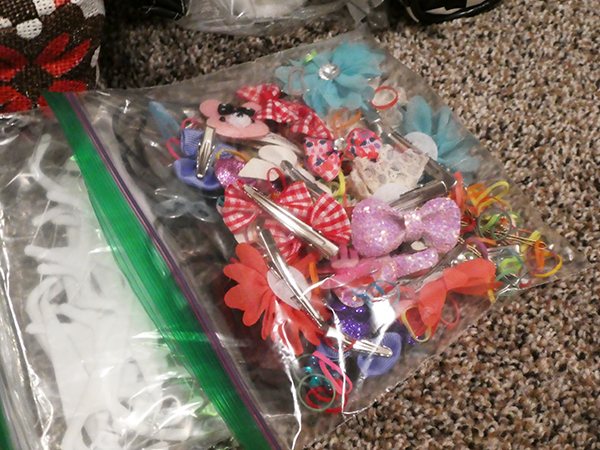 I also keep one of these clear zipper pouches in the extra container in the garage with one nail clipper and tweezer – that way I never miss them. Don’t forget any hair products, hair bows, or chapstick you might need (hairspray will have to be packed in checked bags). Use another clear pouch for those goodies. Curling irons, flat irons, hot rollers (yup, I live and breathe the 1980’s everyday), can be grouped all together. I have a special set of hot rollers I use only for traveling after my prized possession was burned due to a faulty electricity adapter in Beijing. If you need this, you know how utterly important these items are. Don’t forget the cord! This needs no explanation, right? You aren’t always going to need them, but you don’t want to forget when you do. On our Mediterranean cruise we carried around our lumpy passports on every excursion. We learned on this trip to definitely pay the extra $10 when applying for a passport to include the ID card. You only need the passports when traveling through the airport, the cards you take with you around town. It’s a good idea to print out any tickets or reservations you have as well, as you may not have service or reception to access an email copy when it’s time to access them. Gallon size freezer bags are excellent to keep these items from getting ruined and can double as a keepsake for other papers, receipts, and memorabilia you want to bring home. These are all your necessities for getting to the vacation, and being on vacation. What does every person need for the actual plane ride? How long is that plane ride? Do you really love that book you are reading? Are your children okay with sharing ipads, or handheld consoles? You gotta keep everyone happy for several hours up to half a day on a flight, and for your own sanity you don’t want a meltdown, forget the other passengers. Chargers for each electronic device are a must, or you’re going to be up a crick. Lastly, you must have the correct type of adapter for your electronic devices. Major department stores will sell converters for every country on the globe for about $40, or you can buy them individually for each place you are going for about $10. What do you need to prevent a meltdown from occurring during take off? Or when you are on the Metro and your phone translation app isn’t working? That’s what you pack here. Kids are always hungry, and they are the hungriest when no food is available. 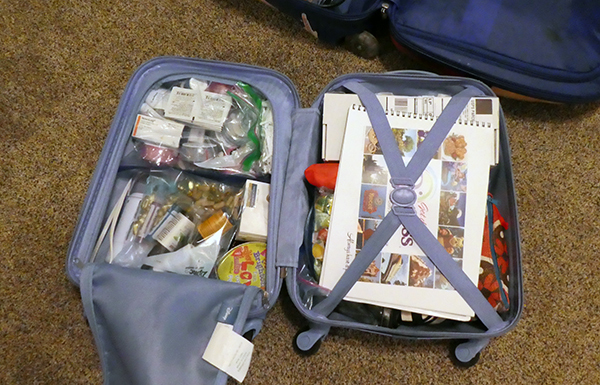 Family Hint: TSA will let you travel with liquids and gels if you have a baby. Want to take a box of applesauce packets from Costco, go ahead! You’ll have to submit to an extra hand and bag swab, but you can take it. However, don’t pack them all in the same bag if you can swing it. This will flag TSA and it will look like a mess inside the scanner. If they are split up though, it won’t raise any red flags. 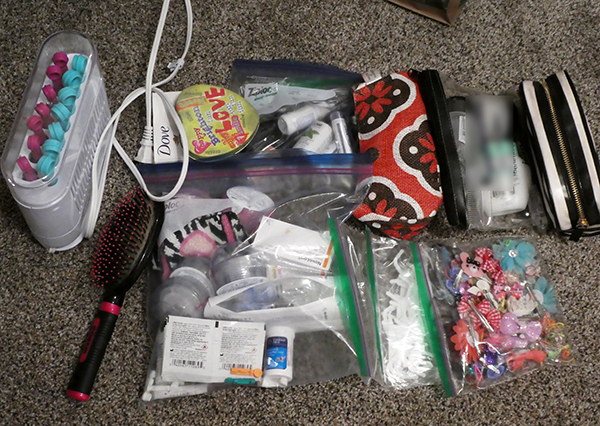 Put everything in gallon ziplock bags, and it’ll be easy to consolidate once you pass through TSA. Does your baby have a favorite toy she can’t live without? Make sure you don’t forget it. It’s a lot easier to have one parent take care of the kids, and one parent to haul around the luggage then have everyone in charge of luggage. We try and pack everything in the smallest bag possible, but one bag. So if it’s our largest suitcase so be it. It’s better than lugging around two, or three. Don’t want to pay bag fees? Trust us, it’s worth it once you have dropped them off at baggage check and you don’t have to look at them again until you arrive. Now that our children are older, they have started pulling their own roller bags. They don’t carry their own clothes though. These roller bags fit underneath the seat in front of us and serve as our carry on luggage. One has snacks and important paperwork/reservations, the other one has toiletries/medicine. We also take a back pack for ipads, books, coloring crayons, special blankets, camera, etc. The items that you want to be able to grab in an instant. That’s it! Sign up for our Newsletter, right over there ? 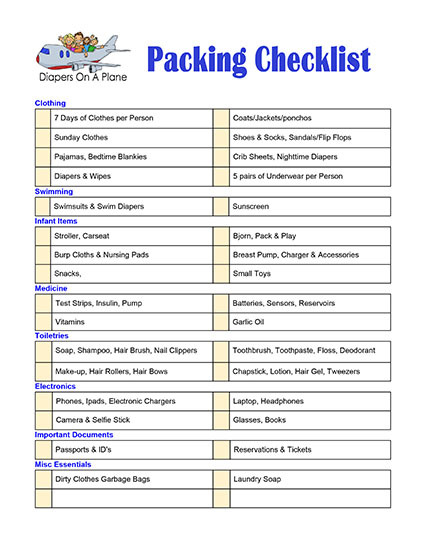 in the sidebar, and receive a free customizable packing checklist for your very own! Now, where we are going?